With over 2,000 courses on Coursera, in just about every subject and at a range of levels, we almost certainly have the right course for you – no matter what goal you’re trying to achieve. However, finding the perfect course in a catalog of 2,000 is often no easy task. 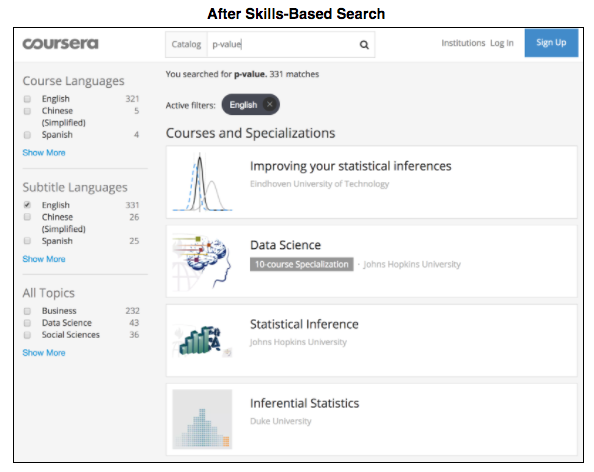 That’s why today, we’re excited to give you a peek into one of our latest platform improvements: skills-based course search. To improve the results from searches like this one, we needed to tag every course in our catalog with the skills you’re most likely to learn in that course. We were able to accomplish that task by leveraging the knowledge of our learner community – we now ask you to answer a short “skills you learned” questionnaire at the end of every course you complete. By combining that crowdsourced data with our own direct observations of skills mentioned in course videos and assessments, we’ve mapped thousands of in-demand skills to relevant courses in our catalog. 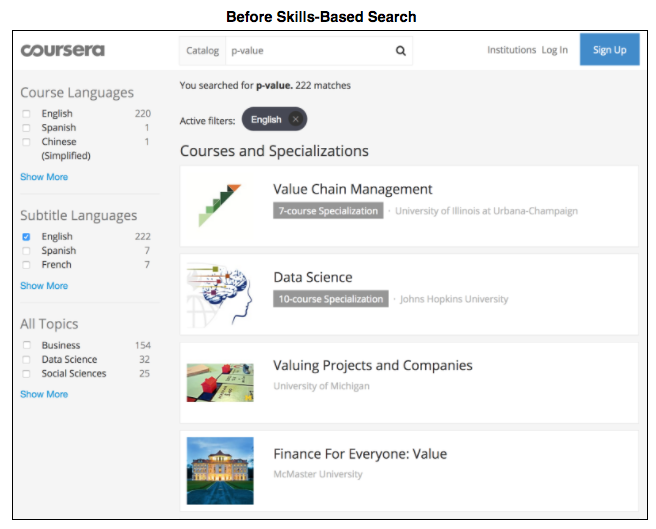 Skills-based search, which is now available to all learners on Coursera, is just one of many possible applications of skills tagging. We’ll be exploring more applications throughout 2017, all aimed at making your experience on Coursera more personalized, responsive, and impactful. We hope skills-based search helps you find that perfect course – and we hope you’ll stay tuned for more exciting updates to come!